Once a year, racing fans and car enthusiasts from all over the world flood into Parc Jean-Drapeau in Montreal. On any normal weekend, the park is a place where visitors may explore an old Olympic aquatic facility, the famous Biosphere de Montreal, or even the islands grand casino. On this weekend however, the park turns into something very different. As many racing fans know, this very special island in Montreal is home to one of Formula 1’s most adored tracks, Circuit Gilles Villeneuve. The Corse Clienti Ferrari Challenge series in North America visits six tracks across the continent in preparation for the Finali Mondiali, held in Monza, Italy this year. Of these six race locations throughout the series, Montreal is the only one where drivers get the unique experience of being a part of a Formula 1 weekend. Drivers get to experience the full festivities of the weekend, as well as compete against one another in one of the opening races, the last before the main event. Racing events at Circuit Gilles Villeneuve outside of the Formula 1 weekend are practically non-existent, so an opportunity to drive this track is truly something to cherish. The track alone holds a lot of history, much of it being Ferrari related. After all, the track was renamed after the famous Canadian Ferrari Formula 1 driver Gilles Villeneuve. All of these things come together to create an experience that really is a dream come true for many of the drivers. It isn’t every day that these drivers get to race in front of over 350,000 fans, the largest crowd in all of Formula 1. The weekend itself was spectacular, especially for Ferrari. Off the track, the Challenge series drivers and Ferrari hospitality ticketholders attended a beautiful event hosted by Ferrari in downtown Montreal. There, attendees were treated to food, drinks, a Cirque du Soleil-like acrobatic performance, and even an appearance from Ferrari Formula 1 driver Kimi Räikkönen and Team Principal Maurizio Arrivabene. Following Kimi sharing his insights on the Canadian Grand Prix, Ferrari North America President Matteo Torre revealed the stunning new 488 Pista on display. Kimi and Maurizio both gave their glowing reviews on this latest special iteration of the mid-engine supercar. On the track, Challenge series drivers enjoyed two Friday practice sessions, a qualifying plus the first race on Saturday, and the final race on Sunday, just before the Formula 1 race. Montreal’s weather was very generous, giving the event clear skies and a clear track to work with. Due to it being the Formula 1 weekend, the schedule was strict and time was limited, meaning all four driver classes within Ferrari Challenge were on track at the same time. A record count of 39 total Challenge cars on track at the same time made for some extremely close and exciting racing. Continental AutoSports Dealer Principal Joel Weinberger ended the weekend with good results in the Trofeo Pirelli Pro class, finishing 7th and 5th overall in the two races respectively. The other two Continental-affiliated drivers, Neil Gehani and David Varwig, experienced some hard-fought battles on track, with Neil finishing well in 6th and 5th in the Trofeo Pirelli AM class races. All drivers enjoyed the energy of being in the official F1 pit lane in preparation for each session on track. All in all, it was a fantastic weekend for both Ferrari racers and race fans, highlighted by the much overdue victory by Sebastian Vettel, the first for the Scuderia at Montreal since 2004. The official Ferrari hospitality area located in the turn-one complex was a great place to see all the action, complete with closed-circuit television to follow the action around the circuit. We saw many of our friends and customers from Autobahn Country Club and Iron Gate Motor Condos throughout the weekend. Early reports said that this year’s race crowd could set a record for attendance at an F1 event this season. 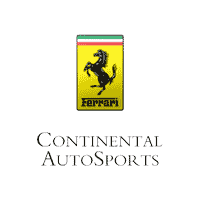 The next stop for our Continental Ferrari Challenge drivers will be the iconic Watkins Glen race circuit on the weekend of July 27th-29th. Ferrari hospitality will be available for those looking for the ultimate spectator experience. Please contact Lisa Leathers at ll@continentalautosports.com for details. Follow us on Instagram @ConAutoSports.